This week saw the opening night of What Shadows at London’s Park Theatre. The play, by Chris Hannan and starring Ian McDiarmid (the Star Wars films, Merchant of Venice, Life of Galileo), is based around Enoch Powell’s Rivers of Blood speech, seen as the most polarising political speech of the last 50 years. Oxford academic and daughter of a Caribbean immigrant, Rose Cruickshank wants answers. Enoch’s controversial words about immigration shattered her childhood. Rose cannot find inner peace until she understands what led him to make the speech that defined a generation. Will a meeting with the man himself give her the answers she desperately craves? Hannan has created a fascinating character in Powell, whose racism and fear was bound up up in a rarefied and romanticised vision of England. This was a man who claimed to be at one with the white working classes, but could barely get though a conversation without quoting Thucydides. The way he leverages his friendship with lefty editor Clem for his own political ends, and the impact it then has, is artfully constructed. What Shadows is gloriously raw, one of those productions with such a good script that it doesn’t need to be, and isn’t, embellished with superfluous sound effects in an attempt to create a dramatic atmosphere. Much of it is well performed, with an uncluttered set that makes good use of video projections. The flitting between the decades – scenes are set in either 1967/68 or 1992 – made things a tad more complex than was strictly necessary. 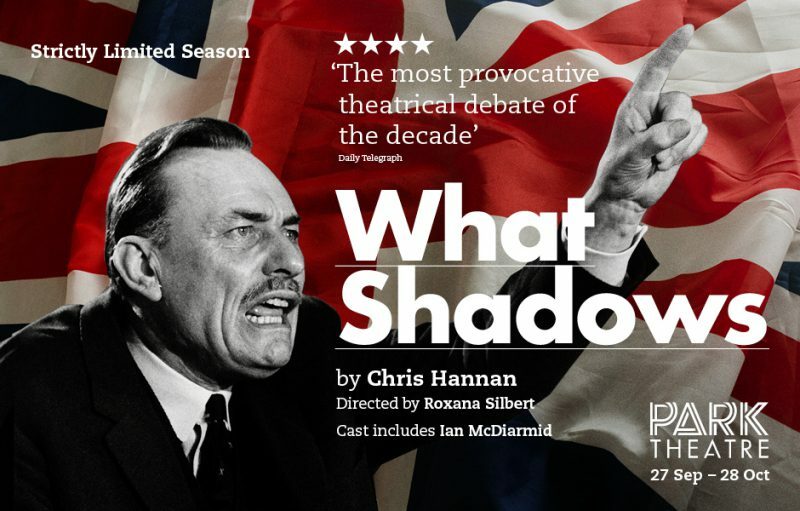 Blown away by @whatshadowsplay @ParkTheatrelast night. Ian McDiarmid was superb. Thank you @dperks13 for a brilliant evening. Had such a great night at @ParkTheatre!! #WhatShadows was amazing & so insightful! I advise anyone to go & see it ???????? What Shadows runs at the Park Theatre until Saturday 28th October, with tickets available HERE.